I was just watching Ina Garten in The Barefoot Contessa …I love that show. There is something so soothing in her voice and accent. Reminds me of all the good things I love about the USA (like cheese in a can, Reese’s peanut butter cups and See’s Candies). Anyway, she was dedicating one of her Back to Basics shows to an article she was writing about what makes for a Magical Ingredient. One of those special touches you add to a dish that really makes it shine. Her Magic Ingredients were Lemon Zest ( in baking and roasting), Instant Coffee (in baking with chocolate) and Tarragon (in her chicken salad sandwiches). So, I thought I’d make a post about one of my favourite magic ingredients. 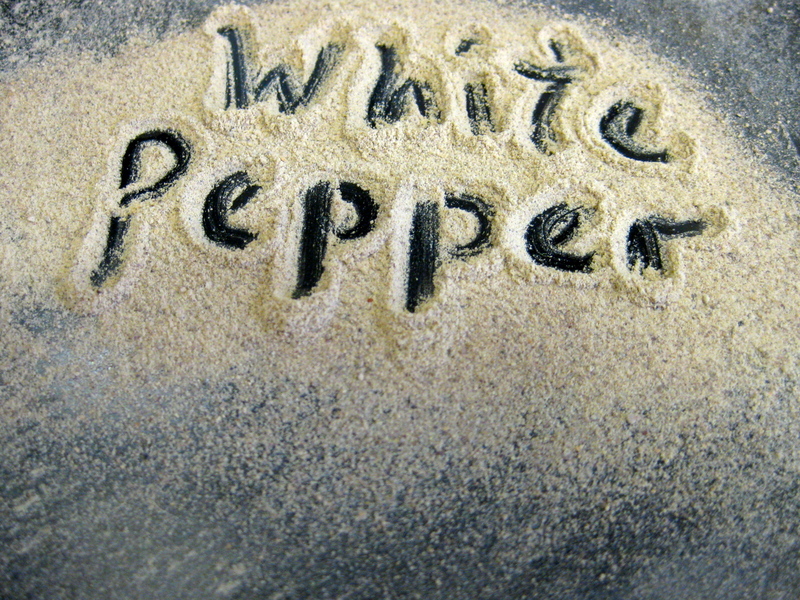 Yes, it’s boring isn’t it, but when you can harness the power of white pepper, you’ll be adding it to your kitchen arsenal as well. It smells different, more pungent than black pepper. It almost reminds me of cumin. I use it when cooking with chicken. Sprinkle it on your roast chicken and you will notice the difference. Add it to your bastes and marinades and you’ll find it gives the flavour that extra nudge into greatness. I also use it in my stir fries, under the instruction of Kylie Kwong (author of ‘Simply Chinese Cooking’ my favourite Chinese cook book ever!). So there it is. Nothing fancy, but it’s my little secret weapon when I want to make my meat or savoury meal taste super fantastic. I would love to hear what YOUR magic ingredients are readers!!! Go on, take a chance, and leave a comment. I LOVE LOVE LOVE getting reader comments. I know i’m not the kind of comment you want but I think Vegeta is a magic ingredient that not alot of people know/use in their cooking. I find Vegeta is perfect for that meal that is just missing that “something” or needs a bit of a kick of flavour, a teaspoon or so sprinkled in and seems to make a meal pop!